The northern tip of New Hampshire is brimming with history to share with you. From the Balsam’s Grand Resort Hotel’s story to Pittsburg’s interesting past as the Indian Stream Republic, there is much to discover in the wilderness, which will connect you to the rural towns within. Here’s a recommended itinerary for history buffs to follow, with a bit of art, food and culture thrown in for good measure! Morning: Start out in Stratford, just a couple miles south of the center of town. The first point of interest is a marker on the left side of the road (if headed north), across from a handsome 1800s farmhouse and barn which is a sight to see in and of itself! You’ll see the hunter green sign which is a historical marker, next to a pull off. It describes log drives which occurred down the Connecticut River in days of old, and overlooks a modern day log yard. Look for these markers as you travel throughout the North Country for more historical insight. Then, as you head through Stratford’s town common just off of Route 3 north, you’ll see an old train station to the left. This houses the town’s public library, open at 9 a.m. Monday, Thursday and Friday. Stop on in for a visit and walk over to see the monuments in the center of the common, and the post office which still has classic mail slots inside. From there, head around the corner to the Colebrook Town Hall. The Historical Society museum is housed on the second floor. Alternately, you can visit an annex of the historical society museum in another impressive building in town — The Tillotson Center. This 171-seat theater for the arts is located on 14 Carriage Lane, just next to the Post Office that is on Route 26 (also known as Parsons Street). From the bakery, cross Route 3, walk down Pleasant Street, head through the parking lot by Daniel Hebert, Inc. and you’re there! In its original form, it served as the horse carriage barn for The Balsams Grand Resort in Dixville, and it has the pictures to prove it! The transformation of the building to how it stands now is nothing short of unbelievable. If you want to plan to catch a show, check the lineup here. Next to the Tillotson Center you can grab a bite to eat at Moose Muck Coffee House, the closest place for miles to find a real latte! Try the chicken salad; it’s delicious! Then, if it’s before 1 o’clock, you best stop in at Mostly Muffins, a little locals joint, just up the road from Moose Muck on the left. It’s a small, family run business with absolutely the best muffins you’ll ever taste, and tons to choose from, so stock up! Jen is the bubbly face of the business who will be there to greet you, and she will send you off with a smile! Afternoon: When you’ve had your fill, head up Route 145. Just north of Colebrook, stop at Beaver Brook Falls for a peaceful break and photo opportunity. Your next destination is the Poore Family Homestead Historic Farm Museum in Stewartstown. It is open June 1 – Sept. 30, weekdays 11 a.m. – 1 p.m. and weekends 11 a.m. – 3 p.m. (or as posted). You can find out more at www.poorefarm.org. The walkable property is a preserved settlement portraying life from the 1830s to the 1990s. You’ll see historical clothing, artifacts, letters, tools, farm implements and more. Occasionally, events are held there, so check their website for details if you wish to visit when even more is going on at the Homestead. End your day with a peaceful retreat to a cabin in Pittsburg, many of which overlook lakes that are wonderful to fish, kayak or canoe. Some lodges offer rentals or guides to help you experience the water activities with ease. The standout dining for the area that has received countless accolades is the Rainbow Grille located at Tall Timber Lodge on Back Lake. Check out what’s on the menu at http://www.rainbowgrille.com/. 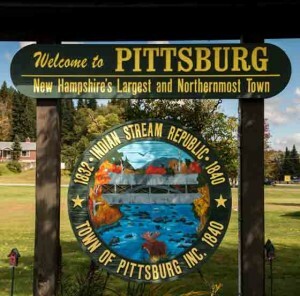 In the morning, learn about the Indian Stream Republic at the historical marker found in the town park on Route 3 and visit the historic Indian Stream one-room schoolhouse just off of Route 3 on Tabor Road, south of town. Bonus: To make a multi-day historical journey through the North Country, check out http://www.chamberofthenorthcountry.com/historical-attractions.html for several other historical points of interest. Enjoy your stay and the rich history of the North Country!